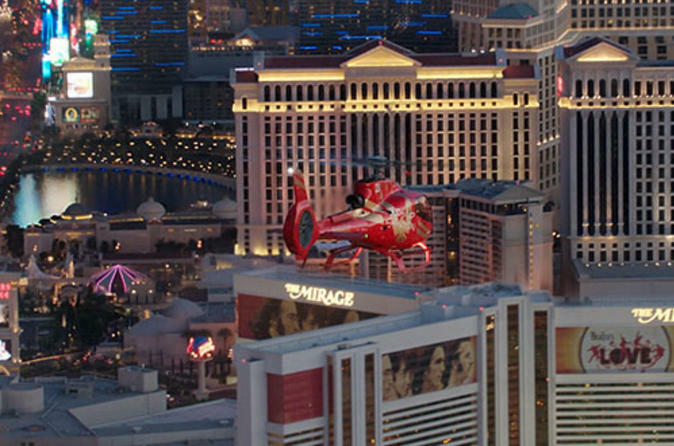 Enjoy a scenic helicopter flight over the dazzling Las Vegas Strip. You will be collected from your hotel by limousine, and then once checked in for your flight, enjoy a complimentary champagne. Your 10-12 minute flight will take you north to Downtown Las Vegas and Fremont Street and then fly back down the Strip to the terminal. Your Eco Star helicopter awaits to take you on a stunning flight over the famous Las Vegas Strip. Enjoy limousine pickup from your hotel, before you're dropped off at the Las Vegas Terminal for your flight. After you check in, enjoy a glass of Champagne before boarding your state-of-the-art helicopter. As you fly over the Las Vegas Strip, see the volcanoes at the Mirage, marvel at the fountains of the Bellagio, fly past the Clock Tower of St. Mark's Square at the Venetian and view the replica of the famous Eiffel Tower at Paris Las Vegas. You will come closer to the Stratosphere than ever before, and then fly over the Fremont Street Experience, where Las Vegas began over a century ago. Special Offer - Book with us and save 5% compared to another travel site! - Book Now!